THE ST. AUGUSTINE ALLIGATOR FARM ZOOLOGICAL PARK: A STORY MORE THAN 100 YEARS IN THE MAKING. READ ON FOR THE FULL STORY OF OUR PARK’S EVOLUTION! 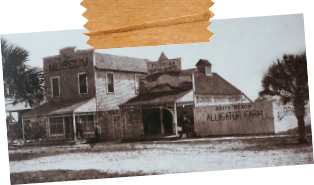 In the late nineteenth century, George Reddington and Felix Fire began collecting alligators on Anastasia Island; they founded the St. Augustine Alligator Farm at South Beach in 1893. By 1910, the Alligator Farm became an established Florida attraction thanks to advertisements placed by the South Beach Railway Company. The Anastasia Island Tram carried vacationers from their accommodations within the city of St. Augustine to the Alligator Farm and other tourist attractions along the island. The Alligator Farm flourished for more than two decades at its original location. It was included in guide books to the area and was featured in a variety of publications. Exhibiting hundreds of alligators, numerous species of Florida’s venomous snakes, and other wild animals, Reddington and Fire’s Alligator Farm earned a reputation as “the world’s largest alligator farm.” A city guide published in 1916 reported that the attraction contained thousands of reptiles. Returning WWI servicemen contributed to the Great Florida Land Boom of the 1920s, and the Alligator Farm looked poised to continue its growth as a thriving tourist attraction. However, a fierce nor’easter ravaged the area in September of 1920. The railroad tracks were washed out near South Beach, ending the tram service and isolating the area’s attractions. That December, a fire destroyed the South Beach pavilion and several nearby cottages. Firefighters were able to save the Alligator Farm and Burning Spring Museum through heroic effort, but a second fire only four months later completely destroyed both facilities, including Felix Fire’s apartment and the original stockade surrounding the alligator pens. The owners of the Alligator Farm had already begun to explore their options for relocating the attraction before the 1920 storm struck. They selected a ten-acre tract of land two miles north of the South Beach location, closer to the St. Augustine hotels, but still on Anastasia Island. The new location was near the lighthouse, a landmark frequented by tourists and picnickers. The area was thriving, and a residential subdivision had been recently developed around the lighthouse. Progress on the relocation was fast. 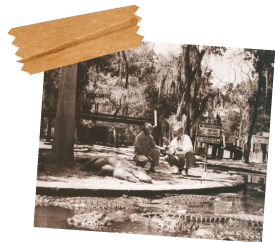 Within a few days of the great September storm, the local newspaper reported “splendid progress” in construction of the new quarters for the Alligator Farm and its collection of animals. The founders continued to operate the park for more than a decade after the successful move. 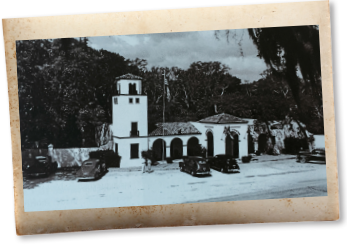 Reddington purchased Fire’s interest in the Alligator Farm by 1934, although Fire continued to serve as the attraction’s curator. A skilled taxidermist, he also prepared exhibit specimens, a role he continued almost to the time of his death in 1953. Reddington and his wife Nellie managed the attraction until 1937, when they sold it to a pair of young businessmen in the community: W.I. 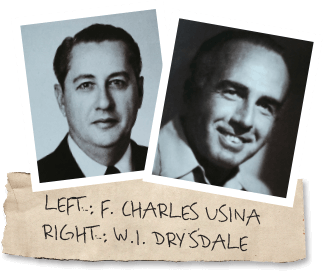 Drysdale and F. Charles Usina. The park’s second owners were hardworking and aggressive businessmen. They succeeded in winning the Alligator Farm a reputation beyond St. Augustine through local and national promotions, capitalizing on the public’s fascination with alligators. At the time of Drysdale and Usina’s purchase, the Alligator Farm consisted of a wood frame building containing offices, a gift shop, and the entrance to the outdoor exhibit. A modestly developed zoological facility, the alligator pens held an unknown number of reptiles, additional animal displays were present, and several acres of undeveloped land remained on the tract. The main building was again destroyed by fire only a few months after Drysdale and Usina took over. Determined to grow the Alligator Farm’s animal collection and popularity, Drysdale and Usina set up a temporary entrance and gift store while they searched for financing. Three months after the fire, they announced plans for the construction of a new building to contain offices, a taxidermy shop, a gift store, and a new entrance to the attraction. Drysdale and Usina also began to improve the exhibits. They acquired animals from the Daytona Beach Alligator Farm and other alligator farms in Florida, as well as from the North Miami Zoo, the Daytona Airport Zoo and the Florida Museum of Natural History. Through Drysdale and Usina’s efforts, the attraction gained a new reputation as more than just an alligator exhibition. Guests viewed ostriches, crocodiles, Galapagos tortoises, a variety of monkeys and birds, and many examples of Florida’s native wildlife. 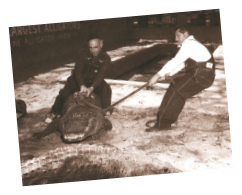 The Alligator Farm experienced increasing growth and financial stability in the years following World War II, leading to sophistication of the park’s education and entertainment operations. Guests came to understand and appreciate creatures that they had previously only feared. The Alligator Farm evolved into a new era beyond its existence as a thrilling roadside attraction. The park even gained mention as a household name through the 1940s and 1950s. The American Weekly, The Saturday Evening Post, The New York Times and the Toronto Star featured articles about the attraction. 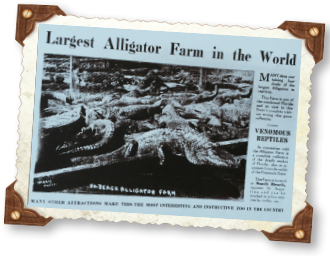 Exposure gained through popular media outlets enabled the Alligator Farm to publicize the plight of endangered wild alligators, which came perilously close to extinction in the 1960s and 1970s. Drysdale and Usina continued operating the facility as partners until Usina’s death in 1966. Drysdale took the reins into the early 1970s, then passed management duties to his son, David. With new leadership, the Alligator Farm continued to evolve and become a key proponent of wildlife research and conservation. 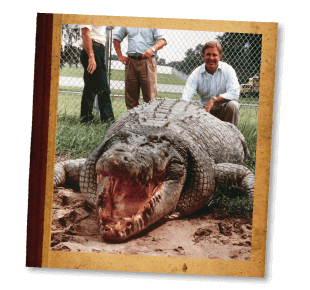 Scientists from the University of Florida conducted research on the grounds and in the waters of the Alligator Farm in the 1970s. Dr. Elliot Jacobson of the University’s School of Veterinary Science and Dr. Walter Auffenberg of the Florida State Museum in Gainesville made intensive scientific studies of alligators. Dr. Kent Vliet, whose research on the courtship habits of the alligator led to his thesis, became a virtual fixture at the facility. Adding to the public’s understanding and appreciation of natural Florida, a nature trail was added to the park in the late 1970s. Exhibits were also continually improved and presentations were polished. A roofed theater and an open amphitheater were constructed for formal exhibitions of snakes and alligators that included lectures on the reptiles’ habits and behavior. The cooperation of the Florida Audubon Society was obtained in the expansion of the rookery that is home to wild and unconfined herons, ibis, and egrets. 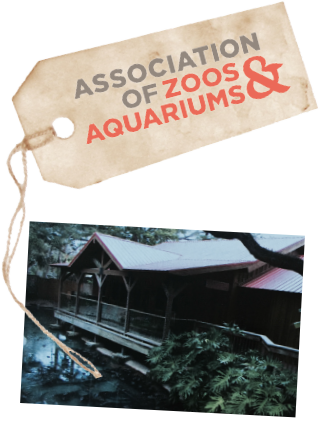 Since 1989, The American Association of Zoos and Aquariums (AZA) has extended accreditation to the St. Augustine Alligator Farm, elevating the institution to a select list of zoos, aquariums, and other zoological facilities throughout the nation recognized for the quality and care of their collections. A new milestone in reptile keeping was achieved when Land of Crocodiles opened in 1993. This exhibit area in the park features all known species of the world’s living crocodilians. The St. Augustine Alligator Farm is now the only facility in the world exhibiting living specimens of all 24 currently recognized species of crocodilian. Continuing our missions of education and conservation, the Anastasia Island Conservation Center opened in 2001. It is used for various functions such as birthday parties, receptions, community meetings, and school groups, but is also home to the AZA’s Crocodilian Biology and Captive Management School, part of the AZA’s Professional Development Program. The Alligator Farm strives to instill appreciation and understanding of crocodilians and all other wildlife in the hearts and minds of all guests, and there is no better way to do that than to offer a thrilling way to view these magnificent creatures. Crocodile Crossing is the Alligator Farm’s zip-line, opened in 2011. 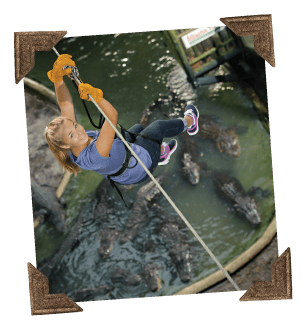 A one-of-a-kind experience, participants zip over the entire park, literally seeing live crocodilians, lemurs, and tropical birds from a new perspective. After more than a century, the Alligator Farm thrills and educates guests on a daily basis. We’re proud of our successful past, and look forward to an exciting future as a privately owned, specialized zoo. The South Beach Alligator Farm and Burning Springs Museum in the 1890s. A 1911 magazine advertisement proclaiming the South Beach Alligator Farm as the largest in the world. The original entrance to the Alligator Farm, that overlooked Old Quarry Road, which burned down in 1936. 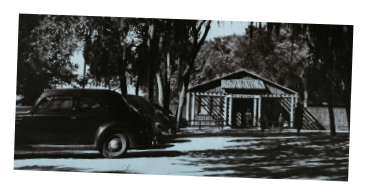 The “Mssion” style main building of the St. Augustine Alligator Farm, pictured here as it looked around 1947. 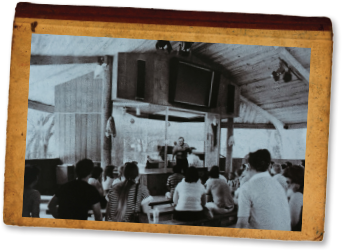 This 1977 photograph shows famed naturalist Ross Allen giving a lecture on alligators to visitors in the new roofed theater. Guests exploring the Native Bird Rookery. 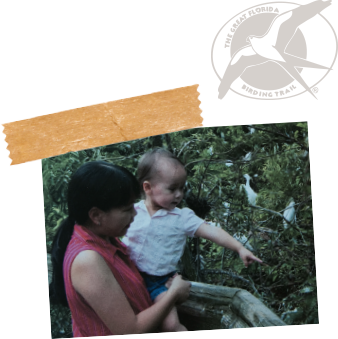 Continuing our missions of education and conservation, the Anastasia Conservation Center opened in 2001. W.I. Drysdale and Charlie Usina moving a reluctant alligator. Radio interview in the alligator lagoon. David Drysdale with Gomek, the legendary giant saltwater crocodile that called the Alligator Farm home from 1989 until his death in 1997. Crocodile Crossing is the Alligator Farm’s zip line, which opened in 2011.